As you all know, one of my biggest missions at M$M is to find ways for you to make extra money! I have a great one that I've been waiting for two months to share with this community. 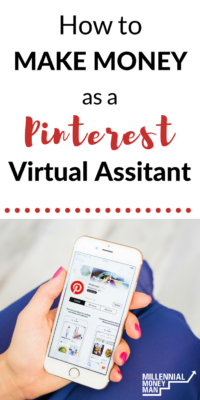 My good friend Kristin Larson over at Believe In a Budget recently teamed up with Gina Horkey from the Horkey Handbook to create the Pinterest Virtual Assistant course. They both have made great money online for years, and are experts at creating online income streams (Kristin is the “Side Hustle Expert” for CBS). Over the past few years, Pinterest has grown a ton and has become a really important aspect of digital marketing for small businesses and professional bloggers. If you regularly use Pinterest for finding recipes or cool DIY home stuff, it is possible to find side hustle level or full-time work where people will pay you to manage their Pinterest accounts (and no, you DON'T need to be a blogger or have a website to learn this skill). You may be wondering: “What the heck is a VA?”…and you wouldn't be alone haha. If you had asked me the same thing when I was a band director a few years ago, I would have had absolutely no idea what it meant either. VA's (or Virtual Assistants) are big in the online world right now. Virtual Assistants are people that offer a wide range of organizational and social media services for small businesses and online entrepreneurs like me. Every big blogger probably has some type of VA doing work for them (even me). It's basically the easiest way to farm out of some of your day-to-day work without having to hire someone full-time. It can be anything from sorting through emails to yes, you guessed it, running someone's Pinterest account for them. Why would people pay you to run their Pinterest account? Like I mentioned earlier, Pinterest is huge right now. Pinterest is a search engine, just like Google, but the content is displayed with images instead of text that you would see in a Google search. It has been popular with food bloggers, interior design sites, and sites like Buzzfeed for years! Now it's becoming a focus for most small businesses that are selling anything from jewelry to blankets through their online stores. Pinterest has a steep learning curve for people that aren't really familiar with it. It may be totally normal for you to look through and find 15+ awesome recipes or furniture ideas for your home and pin them to your boards, but most business owners are so intimidated by Pinterest that they don't even attempt to run their own account. That's where you would come in. This course will teach you how you can offer your services to clients and actually get paid to grow their Pinterest following and site traffic. 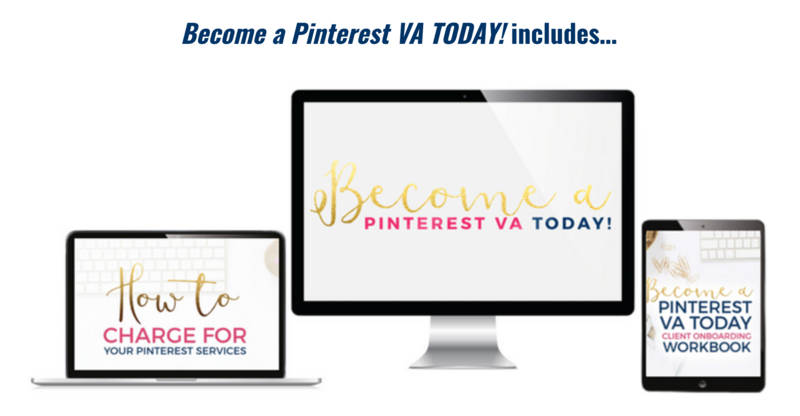 Click here to learn more about the Pinterest VA Course! Back when M$M started getting bigger, I knew I needed to do something on Pinterest. Like a lot of guys, I had no idea how Pinterest even worked. Kristin (the creator of the Pinterest VA course) provides a service through her Pinterest business where she creates pins for people, so I had her make all of the original pins for this site! She did a great job and was huge for helping me learn how to use Pinterest. She has also done work for my marketing clients as well, which has been great for my online business. Everyone that reads this site knows that I only recommend products and services that I have used before and believe in. I know that Kristin's course is good, and she has done great work for me before. Pretty simple. If creating your own Pinterest Virtual Assistant business sounds like something you're interested in, this is the course for you. This opportunity, unfortunately, doesn't last year-round. Kristen and Gina are very hands-on with their course, and only take students at certain times of the year. It will be months before the course re-opens. The Pinterest VA course costs $299 (with an option to split into two payments of $159) and has a 7-day refund policy. You'll also get access to a private Facebook group that will help you grow your business with other people who have taken the course! That feature is honestly worth the price of the course on its own. If that sounds like you – you need to jump on this course while you can. There is so much opportunity to make money as a Pinterest VA right now. I work online and see this niche exploding on a daily basis. How much do you use Pinterest? Yeah Kristin is good man – but I was in the same place as you! I’m starting to get more traffic from Pinterest, but it’s such a steep learning curve if you’ve never used it! Do you know if they require you to already be working as a VA before taking this course? It sounds really interesting and I love Pinterest! I’ve been thinking pretty hard about what I want as a side hustle and this sounds great. Nope, no previous experience required! The course is designed for people that casually use Pinterest in their daily lives.